Barca star Kevin-Prince Boateng is reportedly struggling with a problematic knee which has kept him from making an impact at the Camp Nou. Despite been included in every matchday squad since joining on loan from Sassuolo in the January transfer window. The Ghanaian international has only enjoyed 63 minutes of action which came on his debut in the first leg of the Copa Del Rey tie against Sevilla. 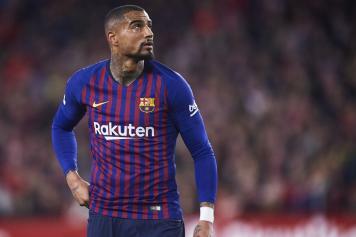 Subsequently, the Catalan giants have played five matches with Boateng curiously having no involvements despite some heavy rotation by coach Ernesto Valverde. According to reports in the Spanish media, the 31 year old attacker has had knee discomforts for a long time now, which push Barça towards limiting his playing time without completely preventing it. Before having left for Barca, Boateng had scored 4 times for Sassuolo, appearing 13 times in the Serie A.